They floated the polyurethane, and it shows. 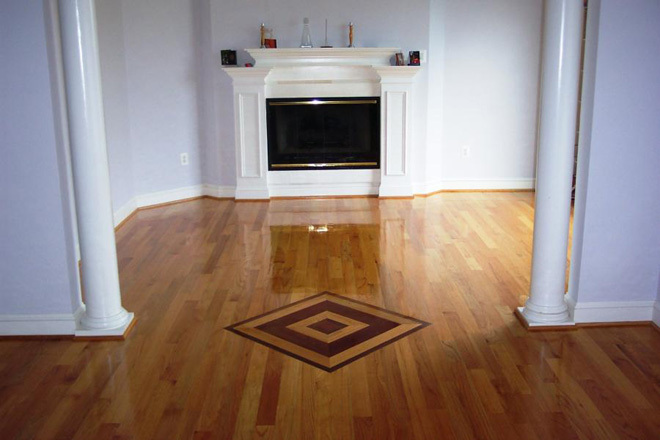 Here is an impressive collection of six wood floor medallions laid down by Clifton Grant Floors of Fairfax, Virginia in a single house. It features a stunning octagonal floor in an octagonal room, the medallion carried throughout the whole floor. The installer began by establishing the center of room using a plumb bob, and then orienting the floor square to the room. The material is 3 1/4 in wide Red Oak plank flooring alternating with 4 in Jatoba plank flooring. The seams were all glued. The finish consisted of three courses of sanding and five coats of high gloss oil based polyurethane. The polyurethane was floated, to an amazing, almost mirror finish. In this same home they executed a number of medallions and borders in American Walnut, Zebra Wood, Yellow Heart, Wenge and Purple Heart. Our favorite is the diamond medallion centered not in the room, but between rooms and squared to a fireplace. 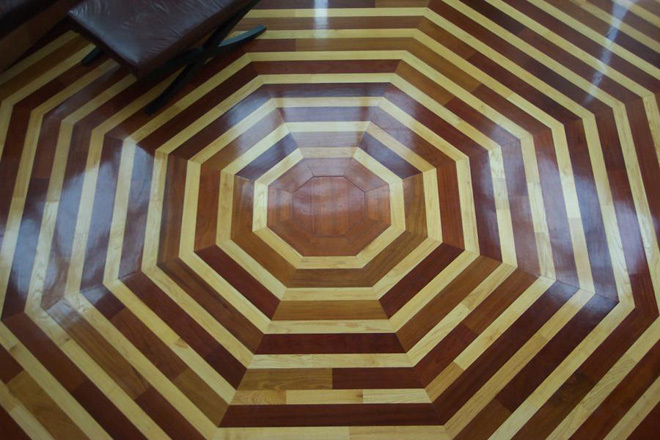 List of Parquet Pattern Flooring Specialists. Targeted diamond pattern extends the focal point of the fireplace into the next room. This entry was posted in Flooring and tagged Virginia. Bookmark the permalink.